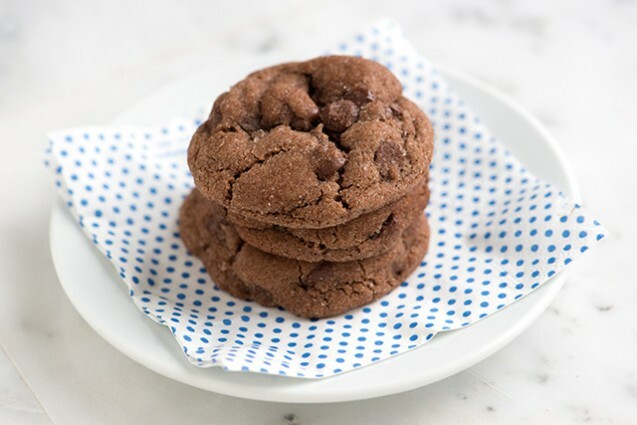 Chocolate and cinnamon are so wonderful together -- especially in the form of these crinkly topped chocolate cookies. Chilling the dough for 30 minutes or so is important, here. It’s a little sticky so the chill help make rolling the dough into balls and then into the cinnamon sugar easy. Sift (or whisk) the flour, cocoa powder, cream of tartar, baking soda and salt together then set aside. In a large bowl, using a handheld mixer on medium speed beat the butter, sugar and vanilla together until light and fluffy, 3 to 4 minutes. (Or, use a stand mixer fitted with the paddle attachment). Reduce speed to low. Add the eggs one at a time, beating well after each addition. Scrape the sides and bottom of the bowl then add the flour mixture in three parts, just mixing until it disappears. Stir in chocolate chips. Wrap with plastic wrap and chill dough at least 30 minutes or up to 3 days. Preheat your oven to 400º F. Line two baking sheets with parchment paper or use silicon baking mats. Shape heaping-tablespoon-sized mounds of cookie dough into balls. Roll in the cinnamon-sugar mixture and place 2 inches apart onto baking sheets. (A medium cookie scoop is helpful here). Bake the cookies for 8 to 10 minutes, until the cookies have puffed a little and the tops look set. Cool on baking sheets for 5 minutes then transfer to a cooling rack to cool completely. (The cookies will fall slightly as they cool). Baked and cooled cookies will keep, stored in an airtight container at room temperature for 2 to 3 days. Also, keep in mind that you can freeze this cookie dough. Line a baking sheet with parchment paper, scoop and roll individual dough balls and place onto the baking sheet (they can be close together), and then place in the freezer until hard, about 30 minutes. Transfer frozen dough balls to an airtight container or plastic bag.